Soak rice and dal for 6-7 hours. Grind dal and then rice into the smooth paste.Add water as per the need. The batter should be thick. Leave the batter for 5-6 hours for fermenting. Put water into the vessel-idli cooker. Let the water get boiled. Now take half batter into a small vessel. Add salt, ½ tsp oil and ½ tsp cooking soda and 3-4 spoon boiling water. Mix it well. Grease oil in the bowls or idli stand and pour the batter into it. Put it in the idle cooker and steam it for 15 minutes. Take it out after 15 minutes and put the other set of idlis. properly and make it soft. 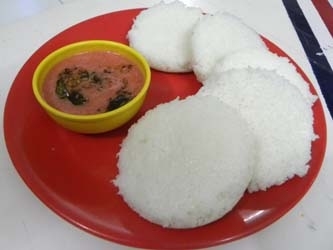 Take out all the idlis and serve it with sambhar and tomato-garlic chutney. Other option is using the ready-made batter. The procedure will remain same. out from the refrigerator before 30-40 minutes so that it comes to the room temperature.